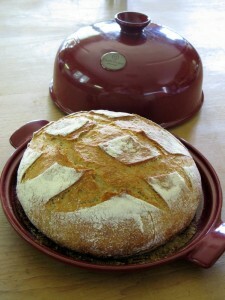 Recently I’ve been testing some bread baking products from Emile Henry. 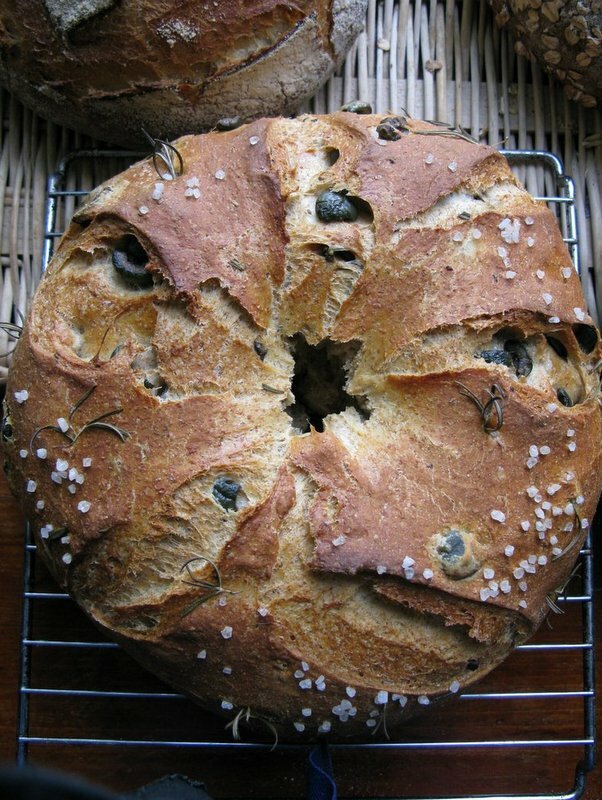 I developed this fragrant Rye Crown Loaf with Olives and Rosemary to bake in their Bread Baking Cloche. It’s the kind of bread that appealing to me right now because the dough has a good percentage of fiber-rich, whole grain rye for flavor. And it is perfumed with fresh rosemary and salty olives. 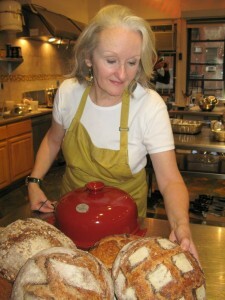 There is little skill required to shape the dough into a large round loaf or boule. But better yet, I poke a hole in the center of the dough before proofing. This makes a giant doughnut-shaped, crown loaf. A slice of this bread produces perfect picnic-sized sandwich slices. With this cloche, you don’t have to concoct a way to get steam into your oven. For the uninitiated, steam keeps the surface of the dough moist so that it can rise while baking. Without steam, a loaf crusts over without reaching its full volume. 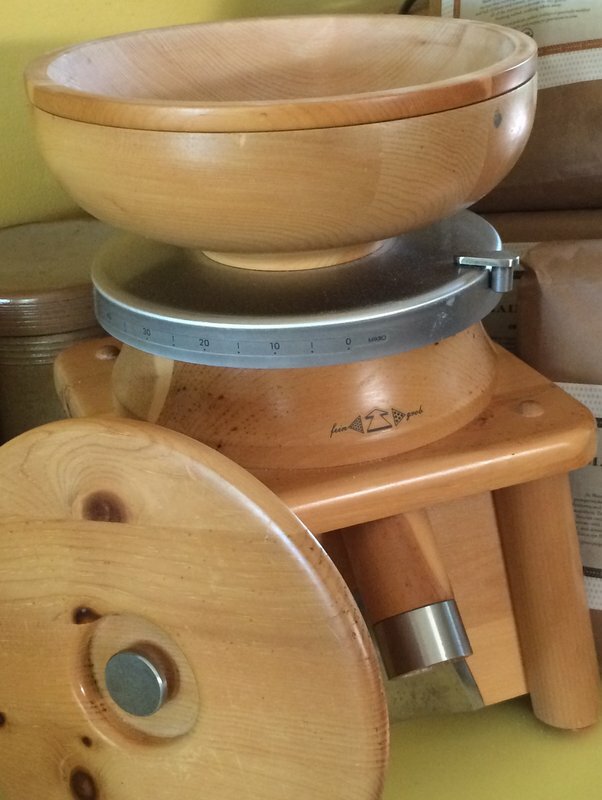 The cloche dome traps the steam that escapes from the dough during baking. And you get a lovely crisp, evenly-browned crust. May seems an odd time to be talking about bread baking. But it is often the case that food professionals work on print projects six or even ten months out. (You should hear food stylists talk about shooting Thanksgiving feasts in the heat of July.) Charlie and I are trying out locally-grown wheat varieties. A case of wonderful flour from Maine Grains out of Skowhegan just arrived. And sprouted wheat too. And we’re taking our little Haussler German grain mill out for some exercise. 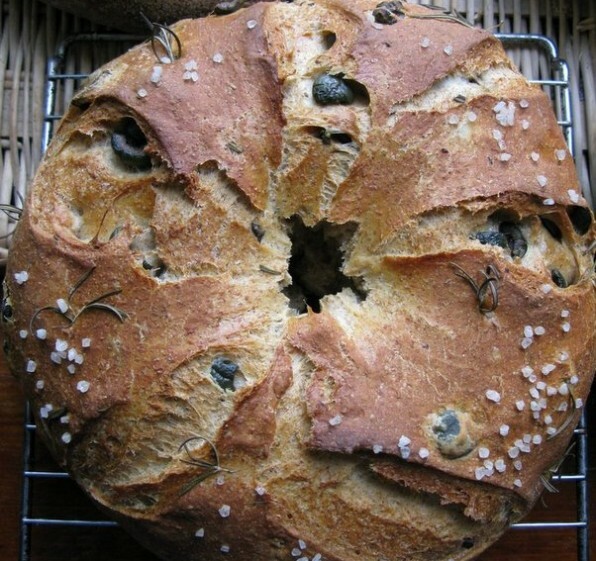 One bread recipe I’ll be making this summer is this Rye Crown with Olives and Rosemary. The dough has a good percentage of fiber-rich, whole grain rye for flavor and is perfumed with fresh rosemary and salty olives. There is little skill required to shape the dough into a large round loaf or boule. But better yet, I poke a hole in the center of the dough before proofing. This makes a giant doughnut-shaped, crown loaf. When you cut into the loaf, you get perfect picnic-sized sandwich slices. Combine the water, yeast, sugar and olive oil in a bowl to dissolve. Add the flours and sea salt. Knead by hand or in the bowl of a mixer fitted with the dough hook into a uniform if slightly sticky dough, for about 6 to 8 minutes. Knead in the olives and chopped rosemary. Form the dough into a ball and place in a lightly oiled bowl. Cover tightly and let the dough rise until doubled in bulk, from 1 ½ to 3 hours, longer in very cold weather. On a lightly floured surface, form the dough into a tight ball. Make a hole in the center then stretch out the dough into a large doughnut shape. Sprinkle the Emile Henry bread baking cloche platter with some flour. (Or line a baking sheet with parchment and sprinkle it with rice flour.) Place the dough on the platter or baking sheet. Cover with the cloche or a sheet of plastic and let proof until expanded to 1 ½ times it original size, about 30 to 45 minutes. Brush the dough with water. Gently press several sprigs of fresh rosemary into the dough. Scatter coarse salt on top of the dough. Using a serrated knife, make six or seven ¼-inch deep slashes across the top of the dough. If you don’t have a cloche, use a baking or pizza stone in your oven. Place it on a shelf in the middle of your oven and preheat it. To make the steam, place a pan on the floor of your oven. We like to use a small cast iron skillet. Preheat the skillet. At baking time, have some hot water boiling. Slide the bread into the oven then toss about ¾ to 1 cup of water into the preheated skillet. Stand back because the steam will burst forth. Then quickly close the oven’s door.